The '87th Precinct' novels by Ed McBain are a blast to read - particularly the early ones. They are short, snappy, and clever books told by a disembodied third-person narrator who provides personality and commentary along the way without ever actually being an active character in the books - think Rod Serling in “The Twilight Zone.” Meanwhile, the ensemble cast of police detectives working the cases prevents the series from ever falling into a rut due to character burn-out. The rotating line-up of featured performers keeps the novels evergreen. “The Con Man” from 1957 is the fourth book in the series, and finds the citizens of the 87th being victimized by a bunco artist using deception to cheat good people out of their money. Meanwhile, a bloated and water-logged woman’s body washes up on the city’s riverbank. Could this mysterious death somehow be connected to the con artist working the neighborhood? The Lebron James of the 87th Precinct is Detective Steve Carella (Did you think I was going to say Meyer Meyer? ), and he is assigned the case of the mysterious floater. The clues are sparse because the river has claimed the hair on her head (Pubic hair: blonde, he notes), and the body is a distended mess. The corpse’s only remaining clothing is a bra stretched to the breaking point by the bloating torso, but a tell-tale tattoo might provide a lead. Through Carella’s eyes, McBain goes into great detail about the medical examiner’s autopsy and the inherent challenges involved with identifying a floater. I can only assume that McBain did his homework because it’s fascinating stuff - but not for the squeamish. About a third of the way through the book, our omniscient narrator opines that the 87th’s big problem was the floater, and the 87th’s little problem was the con man. McBain structures the narrative like the A story and the B story of a TV cop show, and an astute reader is not surprised when the story of the con man somehow merges with the story of the floater. As usual, McBain’s writing is superb. His descriptions of the action are vivid and his knack for dialogue - even when it’s just cops bullshitting in the squad room - is spot-on. 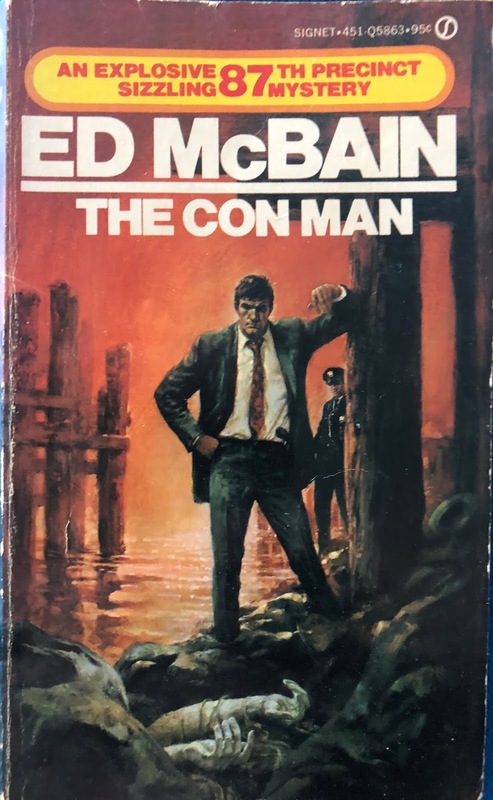 Like his contemporaries Lawrence Block and Donald Westlake, McBain’s writing is a national treasure. Recommended.